Modeled on the ridden three day event, a Horse Driving Trials is in fact a kind of triathlon aimed at testing the overall versatility of an animal in harness as well as its rider. The sport, which has seen Lusitano horses win the World Championship in the ‘four-in-hand’ class, was introduced in Brazil by Interagro, after a period of training of its members and staff at the Coudelaria de Alter, in Portugal, under the direction of Dr. Luis Lupi. Subsequently, five vehicles were imported from Germany, from the well known Künhle industry, which manufactures the best competition vehicles; one is a “Marathon” carriage for that kind of obstacle competition; two of the “Fun-Line” for leisure and less specialized competitions; and two “Phaeton” for leisure and dressage sports. Except for the first one, used for ‘cross-country’ tests, these vehicles may be used as ‘singles’, ‘pairs’ or ‘teams’, the latter including 4 (four-in-hand) or more animals. Interagro already drives teams of 4, 6 and 8 and is starting a team of 10 horses. Driving horses must possess especial characteristics, such as strength and size, ability to perform, good gaits with great extension, and a lot of suspension in the trot, which is the main gait for this sport. 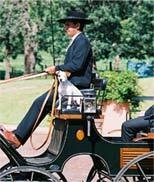 Since 1998 Interagro has been developing its own brand of driving horses. They are ridden first and than harnessed, initially as singles, then as pairs and finally as a team. Experience has shown that the best driving horses should have some Andrade or CN blood, ideally not less than 50%; this blood mixture will normally produce tall, strong horses with progressive movements indispensable for this sport. 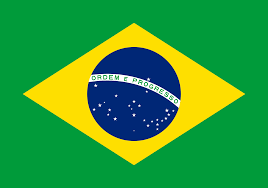 Interagro is today the only horse farm breeding driving horses in Brazil. Besides driving-horse training, Interagro also offers courses for amateurs and professionals in response to an increasing demand for both, experienced drivers and good horses,properly trained and ready to perform. 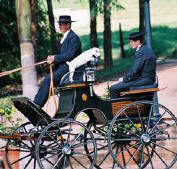 In the August 2002 edition of the Top-Interagro Sale, the record price was obtained by a pair of driving horses: Sendeiro Interagro & Sedutor Interagro, acquired by Haras dos Diamantes, Indaiatuba, São Paulo, new enthusiasts for this sport; they have also imported vehicles from Germany and had their staff trained at Interagro. Apart from the competitive aspects, the growing attention and prestige enjoyed by Horse Driving worldwide is basically due to the enormous pleasure it brings to the people who practice it on a competitive of leisured way. It is a safe, quiet and extremely agreeable exercise for people of all ages, as it does not require the same degree of knowledge and stamina involved in riding. It comes in admirably handy for breeders and owners who wish to enjoy a fascinating experience together with their families and friends. There’s nothing more pleasant than going through the fields to check on mares and yearlings aboard one of these carriages. It’s the sort of activity that once you start you will never stop or get enough of it. Turambar Interagro (grey) e Quebracho Interagro (bay). Because of Interagro’s pioneering work and of the fast growing interest in Horse Driving, the Brazilian Association of Lusitano Breeders (ABPSL) and the University of the Horse (UC) promoted, in August 2004, at the UC headquarters in Sorocaba, São Paulo, a course named “Training Horses for Driving”, given by Antonio Mariano de Souza, head-driver at Interagro Farms since 1988. Antonio worked in Portugal in two different occasions: in 1994 with Jorge Souza, and in 1997, when he took a driving course at Coudelaria de Alter, a 17th century old Royal Lusitano stud and academy now owned and managed by the Portuguese Government. Antonio represents Interagro Farms, in many different events, driving Interagro teams and ministering courses for both amateurs and professional drivers. Antonio has won several titles and prizes in International shows in Brazil, riding and driving Interagro horses. His work has been very important for the introduction and development of Lusitano-Horse driving in Brazil. 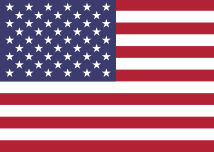 Paralympic Driving (PPD) was instituted in 1968 by Prince Philip, of the United Kingdom, who wrote the rules for this competition for disabled people. The rules have been approved by the International Federation for Equestrian Sports (FEI). The competition consists of three phases and lasts from 3 to 4 days. The first day is dedicated to Dressage competition; the second, to Marathon with Obstacles (which in the 3-day event corresponds to Cross-Country); on the third day competition is about precision and time (chronometer), corresponding to the Classic Jumping. “Many people with physical disabilities assume that riding is not an activity for them, but because they like being with horses, driving offers a reasonable and pleasant alternative to participate in the Equestrian world”, comments Gabriele, a physiotherapist. “It’s mandatory that PPD includes an able-bodied person to perform safety and technical functions. There are currently 15 countries practicing this sport, though that number is still not enough to achieve official Paralympic status. The FEI has been encouraging the practice of this sport and expects that soon there’ll be enough countries to make Horse Driving become an official Paralympic sport” Gabriele concludes. The Club Hípico de Santo Amaro, in the city of São Paulo, Brazil, is going to host a course for Paralympic Driving instructors between 12 and 14 December. The Driving Team is headed by driving-master Antonio Mariano de Souza and his assistant Fábio Roberto da Silva.